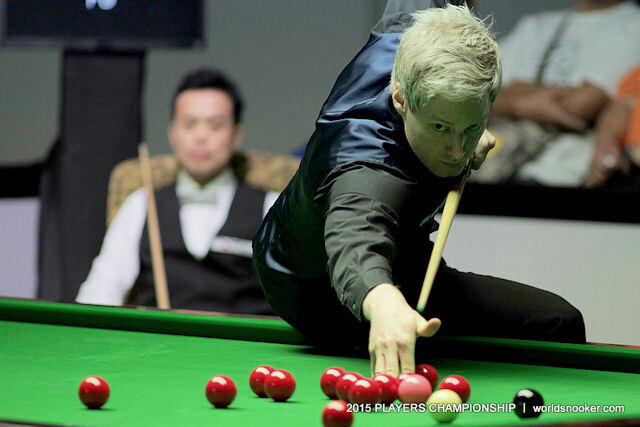 Neil Robertson came from 3-1 down to beat Marco Fu 4-3 in the first round of the Players Championship in Thailand. World number two Robertson was in danger of an early exit at the world ranking event in Bangkok when Fu made a break of 80 to go 3-1 ahead. But Australia’s Robertson made a 74 in frame five before taking a tight sixth frame, then won the decider 61-16 to reach the last 16 of the £350,000 tournament. “It was a very tough match, at 3-1 down I really had to dig deep,” said Robertson, who was runner-up in the tournament in 2012 and 2013. “Everyone has just flown in from the UK so it takes a couple of days to settle down. I didn’t feel tired, I just didn’t adjust to the conditions as well as I had hoped. Chris Wakelin kept his excellent recent form going with a 4-0 win over Robert Milkins, highlighted by breaks of 66 and 65. Ding Junhui’s series of defeats continued as he lost 4-1 to Joe Perry, whose top breaks were 53, 98, 74 and 51. Mark Allen came from 3-2 down to beat Ryan Day 4-3, making a break of 94 in the decider.